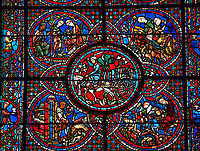 Images of the Gothic medieval stained glass windows of Notre Dame de Chartre Cathedral. 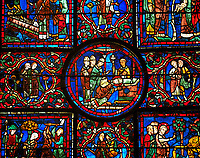 Charlemagne who supposedly donated the Sancta Camisa, believed to be the tunic worn by the Blessed Virgin Mary at the time of Christ's birth, to Chartres in 876 also has a window dedicated to him. 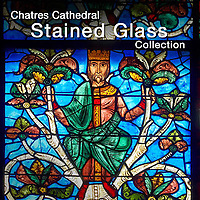 Early medieval glass was soda-based and examples of a richly-coloured blue glass that was produced using soda as the alkali can be seen in Chartres. 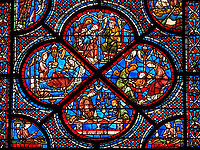 Paint was also applied to glass as a type of enamel, usually dark brown or black, formed from a mixture of: ground copper or iron oxide; powdered glass; wine, urine or vinegar; and gum arabic. The enamel was fixed by ‘firing’ the glass in an annealing oven.